Habit: Subshrub 30--100 cm, glabrous or stem finely hairy proximally; clumps large, woody-branched. Leaf: generally cauline, 20--70 mm, linear to lanceolate, entire. Inflorescence: glandular. Flower: calyx 4--8 mm, lobes lanceolate to narrowly ovate; corolla 22--33 mm, upper lip forming hood over anthers, lower lip strongly reflexed, red to orange, sparsely glandular outside, floor glabrous; anther sacs 1.8--2.5 mm, dehiscing at proximal end 1/4--1/3 their length, glabrous on sides; staminode glabrous. Chromosomes: 2n=16. 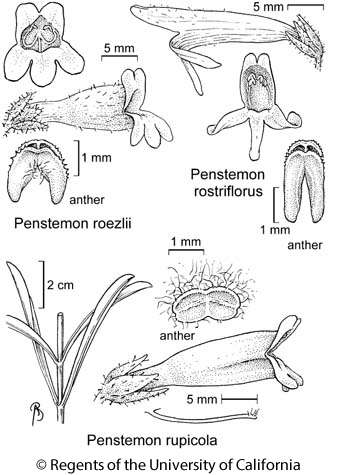 Citation for this treatment: Margriet Wetherwax & Noel H. Holmgren 2012, Penstemon rostriflorus, in Jepson Flora Project (eds.) Jepson eFlora, http://ucjeps.berkeley.edu/eflora/eflora_display.php?tid=37075, accessed on April 25, 2019.
c&s SNH, TR, PR, SNE, DMtns; Markers link to CCH specimen records. Yellow markers indicate records that may provide evidence for eFlora range revision or may have georeferencing or identification issues. Purple markers indicate specimens collected from a garden, greenhouse, or other non-wild location.